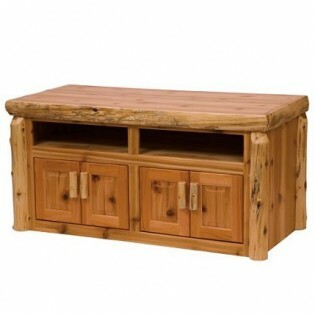 Add this rustic Widescreen Log TV Stand to your living room or family room. It is individually hand crafted and made of hand peeled white cedar logs giving it a natural rustic look. It is clear coated with a catalyzed lacquer finish for extra durability. Add this rustic Widescreen Log TV Stand to your living room or family room. It is individually hand crafted and made of hand peeled white cedar logs giving it a natural rustic look. It is clear coated with a catalyzed lacquer finish for extra durability. It has a plenty of storage space in the cabinets and two DVD/Receiver openings to accommodate multiple components.